12°C, grey start but warm sun later. Cycle Kona (fixed): Distance: 60.4mi, time: 03:44:44, pace: 3:43min/mi, speed: 16.1mi/h. Who knows why, but the GPS recorded 88 miles for today. Maybe some interference on route. Could overhanging trees do that? The route took in my favourite measure- Bannister Hill. Like last time, I didn’t make it to the top, but I did get twice as far this week before walking. I weigh 4lbs less than last time and there was no wind, so nothing to blame. Later, I happened upon the Ormskirk club in a layby so I joined them for some chaingang miles to Southport. 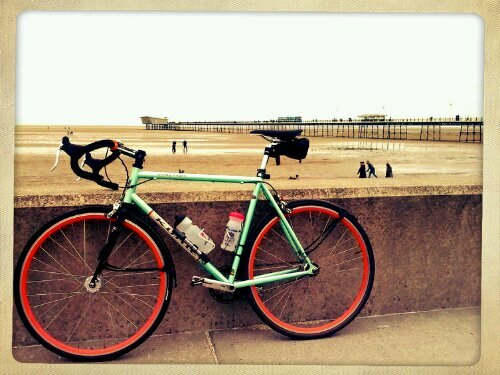 That was tremendous, but my legs burnt up with lactic acid and I dropped off along the sea-front. That’s where the anomalous GPS position was recorded (I found later). I stopped for a snack and to ease my sore legs. It was so much fun though. They are a good group whom I feel safe riding close with. The day finished in warm spring sunshine smelling sweet.